Consoles used to be an all-in-one deal, with perhaps only a memory card needing to be added. That’s all changed now, but optional extras are often the last thing on your mind when buying a console; you want to be dazzled by the games, not the expandable storage, after all. Nintendo Switch accessories are definitely worth your time, however, whether it’s a hard case to keep your system safe or a Switch SD card that’ll increase its meagre storage space. Get your hands on more savings, price-cuts and bargains via our guide. With genuinely useful additions in mind, we’ve hunted down the best Nintendo Switch accessories for you in our guide below. For example, you can often get a SanDisk Ultra 64GB memory card for around $11-$20 on Amazon. That’ll more than double your Switch’s storage space, avoiding the fuss of deleting old games to make way for new ones (alternatively, you could spend around $9 more for the 128GB version). There's also our favorite carry case for $13.99 or so on the same site. We'd definitely recommend grabbing one if you'll be using the Switch when out and about. A rechargeable battery - like Anker's PowerCore 20100 power bank - is a similarly good investment. It'll keep your console topped up while on the go, a necessity for long journeys. You can find all of our recommendations below, not to mention juicy savings as well. Make sure you pop back every now and then if you don't see anything that tempts you; these listings are updated every day. A drawback to the Switch as a console is its limited storage space: you’ll only get 32GB of internal memory out of the box. This won’t carry you very far, and before long you’ll be deleting old games to make space for new ones. That’s why Nintendo Switch SD cards are a must. They'll boost your system’s storage by a long way, and SD cards aren’t too pricey these days either. To get specific, we’d recommend the SanDisk Ultra 128GB card. This is enough for 5-10 big games or a load of smaller titles, so it’ll definitely keep you going for a while. Switch blurs the line between handheld and home consoles, but its portability means you'll need the best case for Nintendo Switch to keep it all safe. There are two different kinds, generally speaking: the typical zip bag for carrying everything from A to B and a hard shell to use while you’re playing. We’d recommend the Orzly carry case for practicality, while the Mumba is top-notch body armor on those morning commutes. You’ll find the best price for both below. The Orzly takes the kitchen-sink approach to storage; it’ll fit the console, multiple Joy-Cons, games, cables, and SD cards inside without any fuss. It’s not too hefty or expensive either, and it can also fit a Switch with its Mumba shell attached. This is the ideal way to keep your console safe from knocks. Grippy and sturdy in equal measure, it’ll make you feel more secure when taking your Switch out with you. Happily, it also fits into the Orzly carry case we mentioned above. New handsets are eye-wateringly expensive regardless of console, and Switch is no different. Because of this, we've rounded up the best deals to get you a Nintendo Switch controller cheap. No matter whether it's a pair of Joy-Cons, a Pro Controller, or something else entirely, we've got you covered. You may get two of these with the Switch itself, but more is a must if you have lots of friends or family joining in on the fun. Sometimes Joy-Cons aren’t enough; sometimes you want something a bit more traditional. Enter the Pro Controller. This classically-styled handset has a layout that draws on everything from the Gamecube to Xbox One, and it’s a must for games like Super Smash Bros. Ultimate or Splatoon 2. While you can get them cheaper from other manufacturers, you’re better off with the official Nintendo model in our experience. Not only is the build-quality excellent, it boasts Amiibo functionality that third-party alternatives lack. If you’re feeling the itch for a hit of nostalgia, we’d recommend looking at the 8bitdo controllers. You can get one shaped like the SNES handset with added analogue sticks and a share button to make it fully compatible with the modern Switch. There are more Switch accessories on the market than we have time to discuss, but a few extras are worthy of your attention. 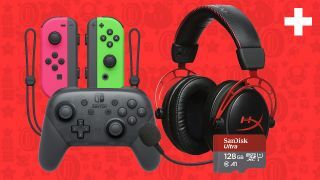 We've gathered the best of the rest here, including everything from headsets to Nintendo Switch chargers. If you want the right balance between price and performance for your Switch, look no further than the HyperX Cloud Alpha. It's comfy, durable, and has a superb frequency response range, meaning the sound is richer than most other headsets and it's less bassy and noisy. You can pick this one up for less than $80 / £70, and it's a great pair of cans - easily the best Nintendo Switch headset out there. We’d say the best portable charger for Switch would be the Anker PowerCore 20100. As an officially licensed product, you know you’re getting good-quality tech right away. It’ll give you up to 10 extra hours of power as well. You may not be able to get the Nintendo Switch-branded version so easily these days, but the standard model should do the job just fine. This does exactly what it says on the tin: your Joy-Cons fit into a shell that provides a more comfortable gaming experience while topping up their power at the same time. It’s a good of way of extending your play sessions when out on the road. If you mostly play your Switch at home and with other people, this officially licensed PowerA charging dock will do the trick. It charges four Joy-Cons at once and will show each one’s individual readiness with LEDs so you can swiftly get back in the game. Although the Switch has a kickstand of its own, it can be hit or miss in terms of getting the angle right for tabletop gaming (curse you, screen glare). This well-made, portable playstand avoids that problem, all while leaving the Switch’s charging port accessible for a boost of power. Sidestep a case of the butterfingers with these Joy-Con straps. Nintendo gives plain black ones away with Switch consoles, but if you’d prefer to personalize yours with colors to match your Joy-Cons then this is your best option. That said, be advised: they don’t come in pairs.